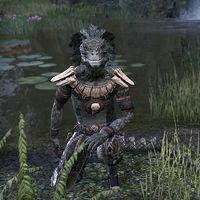 Nisswo Xode is an Argonian nisswo who can be found near the cave entrance leading into the Teeth of Sithis. He was one of the custodians of the old temple to Sithis and was the only to escape when Shuxaltsei and her Sun-Eaters invaded the temple. As you approach he will warn you to stay back as he is not sure if you are under Shuxaltsei's thrall or not. "You are not one of her thralls? No, you do not smell like them. Quickly, you must help me! I only barely escaped her clutches, but my root-sisters and brothers were not so lucky. Every moment we delay will be measured in innocent blood." Who is it you escaped from? "Shuxaltsei. Devours-the-Sun. High-Priestess of the Teeth. She has many names, all of them spoken softly. She has returned from dusk to reclaim her temple and we are the offerings she makes for Sithis's favor." "Yes. What blood she does not drink is spilled on the altars of the temple. For what purpose, I do not know, but many have died for the sake of her terrible rituals. Very well. I'll put a stop to these sacrifices. "The priestess holds them in the Teeth of Sithis. Use the tunnel beneath the waterfall to reach the xanmeers on the ridge above. We will regroup at the top of the western xanmeer once you've found the others." Do you know where I can find the other captives? "I only know that we were kept in the chambers beneath the twin xanmeers. If anyone is still alive, that's where they will be found. Be cautious, they will be guarded by those Shuxaltsei has enthralled. They overwhelmed us with ease." "We were custodians of the Teeth of Sithis. Though it does not serve the same purpose it was built for, it is no less sacred. When the pitiful souls under the high priestess's sway came to defile it, we resisted them, but her power was too much." Is it unusual for a high priestess of Sithis to make blood sacrifices? "Her way is the old way, from before the fall. We were less mindful of the cycle of change and gave only to the Void. When the Hist revealed the true path to us, she chose to break the branch of her bond rather than turn back, or so the story goes." You make it sound like this is ancient history. "It is. The tale of Shuxaltsei's betrayal and fall is a reminder not to stray from the guiding boughs of the Hist. I thought the lesson was embellished for effect, but it seems the only exaggeration was her demise." You believe it's really the priestess from your story? "The story said she was cast down and entombed far from the roots of the Hist, never to return, but every spine on my body tells me the twisted creature that bathes in the blood of my fellows is Shuxaltsei." What can you tell me about the Teeth of Sithis? "A wonder from before dusk. Built high to cast Sithis's long shadow over the land. A reminder that Sithis is always looming. Waiting to return us to nothingness. The old ways were flawed. Many saw Sithis as destroyer, but not as creator." How are the new ways different? "The old ways sought to appease Sithis, so it might spare us from destruction. In our ignorance, we struggled against its will like the muck we built upon until we neared collapse. It would have swallowed us if the Hist hadn't shared their wisdom." What did the Hist share with you? "That Sithis is not only destruction. Sithis is change. Sithis tears down the old so that the new can grow. So we learned to flow with the river, instead of struggle to alter its course. These are better times, but Shuxaltsei cannot see that." Once you have found and freed the survivors, you can follow them up to the top of the western xanmeer where Nisswo Xode is waiting for you. "I am grateful the Hist has guided you all to me, but … is this everyone you were able to find?" I found nothing in the eastern xanmeer but the priestess's thralls and the reek of mingling blood. Whoever was there has already been taken to bleed on the temple's teeth, or her own." "She will find others. Before the fall, Shuxaltsei drenched the Teeth of Sithis with sacrificial blood from dawn to dusk. As the thing she has become, her need is greater now and so is her power. I can feel it coursing through this temple." "Like the blood spilled here begins to pulse through dead stone. The beating of this temple's heart is slow, but it echoes through the Void. She is calling to Sithis. We cannot let her be heard." "I fear what Shuxaltsei has begun may not be undone by her death alone. We must stop her ritual and forever silence this temple to the old ways. Destroy the altars. Only then can we be certain the high priestess will not get what she wants." Is destroying altars to Sithis a good idea? "They have stood too long already. They stand for a Sithis that is no longer, or never was. It seeks change. Whether that change is good for us is for it to decide." You really think her ritual is that dangerous? "Shuxaltsei was not cast down for simply clinging to the old ways. She forsook this world. Her prayers of appeasement became invitations for destruction. I believe she has returned to finish what she started when the tribes rose up to stop her." "To cast this world into darkness. To see the Hist wither and die. To sow destruction until the great serpent returns us all to the Void." You believe she's capable of that? "Shuxaltsei returned from beyond the grip of death for this purpose. Who knows what is within her power?" Most of these fiends are Blackguards, or were. What's their connection to Shuxaltsei? "Some may be faithful to her as a priestess of Sithis, but I think most fell victim to her power. After the Blackrose riots destroyed the prison there would have been no shortage of outlaws wandering the swamps for her to prey upon." Still, if she's been around as long as you say, I wouldn't expect to see so many from one group. "The Rose was built upon ruins, built upon ruins, built upon ruins. The Hist only knows what was buried beneath, but if anything was to stir Shuxaltsei from her grave, the bloodshed of the prison riots would be it. But we have more dire concerns." Once you have ended Shuxaltsei and exited Sithis' Teeth, you will overhear Nisswo Xode speaking with the other survivors. Nisswo Xode "Come, the Teeth of Sithis won't be safe until we get aid from the tribes." Nisswo Nedhellas: "So we're not going back? Give'em a good bash ourselves?" Nisswo Dakee-Kai: "I would rather gather support in Lilmoth. get some rest, maybe a warm meal." Nisswo Nedhellas: "I bet Sithis would want to bash…." Nisswo Xode: "Right now, I am strongly considering it." "The temple seems quieter and the spines of fear and dread lie flat again. It is done, isn't it?" I destroyed the sacrificial altars and put an end to the high priestess. "Then the last remnants of the old ways have finally been shed and the story of Shuxaltsei ends as it was always meant to: with a new beginning. We are grateful for your help. The Hist were wise to guide you to us." Once he has rewarded, he can be asked about their immediate plans. "Shuxaltsei fought against tides of change longer than we can know, but in the end the old always gives way to the new. May she finally find peace in the Void." Now that Shuxaltsei is dead, what will you do? "Though dead, the husk of the old ways still hangs over our temple. We three will go to Lilmoth and beseech the tribes to help Sithis cast off these remnants. If their warriors scour our temple clean, we will return." And if they can't, or won't? "Then we were not meant to be there and we will take our teachings elsewhere, another lesson wiser." This page was last modified on 29 December 2018, at 01:04.